I’ve mentioned once or twice that life is funny. And I’m sure you can think of funny instances in your life too… But here is what happened to me in the last 24 hours (and then a week ago same night… aka last Wednesday night). 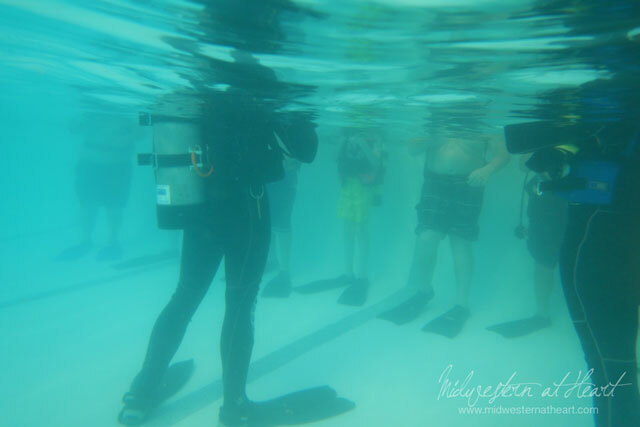 During the summer we go to a Children’s Camp that is close to home and allow these students/kids to try SCUBA diving in the swimming pool. This swimming pool is maybe 6 feet at the deepest point although I don’t think so. I can stand on my tip toe and have my head above water at the deepest point. So what I’m getting at is it is a very controlled environment. Then we have divers in the pool and on the outside watching the kids plus there are counselors for the camp as well. So extremely controlled environment to try this for these kiddos. Usually on our way to camp we stop and eat dinner. Last night was no different. We took the Chief’s bus and then Dan met us there in his car. There was a parking spot between the two vehicles and a semi truck driver backed his semi into that spot. It’s not semi parking, but he used it that way. Then last Wednesday night I went into the changing room to get out of my swimsuit and back into my street clothes. (every other week is boys/every other week is girls). There were a bunch of girls in there chatting and as I entered a few exited. One of the girls that exited said, Hi person I don’t know, I assume referring to me and then exited the changing area. The other group of girls that were in there started mouthing off, “This is our bathroom and you don’t belong in here anyway.” I figured they were talking about the other group of girls, but wasn’t sure since I’m not one of them so I said something to them to their immediate response it was directed at the other girls. I don’t know but I sure felt weird…. So moving forward to last night, boys week… I had Dan go into the girls room to make sure there weren’t any boys in there (because they allow all boys to use both on their week, all girls to use both on their week since there aren’t opposite genders… you get the picture). then Dan said he’d watch the door. I went in to give the baby a shower and get her redressed and out of her swimsuit. Just as we were coming out of the shower (I was still in my swimsuit) I had the baby in a towel and was getting ready to get her dressed, the door opened, and a boy entered. I’m pretty sure we were both shocked. He proceeded to tell me this was the boys dressing room. I told him that while we’re here we needed a place to change too and this was ours, get out! Then I got Dan’s attention and told him he didn’t do a good job of guarding the door. At least I was still dressed! Yikes! Oh dear, if these are the stories from the first two weeks, what will the next 6 bring? Stay tuned to find out… Hopefully nothing involving me!